The City of San Antonio Fiscal Year began on October 1. The FY 2019 Budget is currently underway. The calendar below provided the key dates for the preparation and delivery of the City’s Proposed Operating and Capital Budget. Friday, June 21 “Special” Session: City Council Budget Goal Setting Session for the FY 2020 Budget and FY 2021 Budget Plan (potentially covering the hours of 9:00 AM to 5:00 PM). Summary report of community input will be presented to City Council. Month of July Meetings with City Manager and necessary staff to review budget recommendations and service delivery plans utilizing identified City Council Goals and Service Delivery priorities (meeting dates and times to be scheduled). Thursday, August 8 City Council “A” Session: City Manager presents FY 2020 Proposed Operating and Capital Budget to City Council and City Council considers the FY 2020 Proposed Ad Valorem Tax Rate and sets date, time and place for two (2) tax rate public hearings (if necessary) and two (2) budget public hearings. City Council Budget Worksessions will take place after the budget is proposed. At these sessions, City Staff will review the budget proposals with the Mayor and City Council in detail. All worksessions are held at 114 W. Commerce Street in the Municipal Plaza “B” Room. Once the Five Year Financial Forecast is presented to the City Council, they are asked to identify goals and priorities the upcoming budget should address. A goal setting session workshop takes place to provide City Council a format to provide City Staff with their service priorities for the upcoming budget year. Community input is an important part of the budget process. Feedback from community input provides valuable direction to City Council and City Officials prior to the preparation of the City’s Proposed Operating and Capital Budget. It's your city, make your voice heard! Learn about the proposed Fiscal Year 2019 budget with your friends and family. It's your chance to meet your neighbors, city leaders, and learn more about city services while enjoying free entertainment, free health screenings, and fun giveaways! 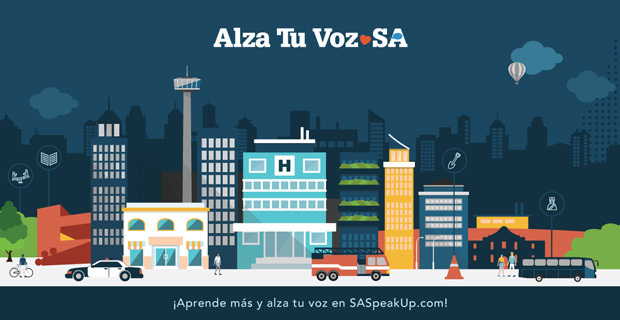 ¡Es tu ciudad, alza tu voz! Aprende más acerca del presupuesto propuesto para el Año Fiscal 2019 en compañía de tus familiares y amigos. Es tu oportunidad para conocer a tus servidores públicos y aprender sobre los servicios que ofrece tu gobierno de la Ciudad mientras tú y tu familia disfrutan de entretenimiento, rifas y ¡exámenes de la salud totalmente gratis! Your feedback is crucial! Last year residents overwhelmingly told us they wanted more money for infrastructure, streets and sidewalks and the City delivered! Tell us what you want in your budget by visiting www.saspeakup.com. MAKING A DIFFERENCE...ONE SUGGESTION AT A TIME! The City of San Antonio’s Budget Input Box initiative provides a forum for residents to offer their suggestions on how the City of San Antonio can save money or improve City services. Suggestions or ideas that fall within the scope of what the City provides will be reviewed and considered by City staff for the Budget Development Process. This suggestion is for: This will allow you to select a department within the City where your suggestion would make a difference. Suggestion: This is the "what and why" of your suggestion. It should reflect with as much detail as possible what you are suggesting to be done. It should also explain with as much detail as possible the reason for implementing the suggested idea. Although this information is not required, we encourage you to provide us with your email address so we may be able to contact you if additional information or clarification is needed. Paper Form:See Locations of Budget Input Boxes across the city. Thank you for providing us with your input for the Budget Development Process. Me gustaría sugerir: esto indica lo que su sugerencia significa: Ahorrarle dinero a la Ciudad o Mejorar los Servicios de la Ciudad. Titulo de la Sugerencia: Este describe, en pocas palabras, el punto principal de su sugerencia. Sea lo mas breve posible. Nombre del Departamento: Esto ayudara a identificar el departamento en el cual su sugerencia hara la diferencia. Descripción de la Sugerencia: Este describe por detalle su sugerencia. Por favor sea lo mas detallado y claro posible. Aunque esta información no es requerida, se le sugiere incluir su dirección de correo electrónico por si se necesita clarificar información acerca de su sugerencia. Gracias por su participación en el desarrollo del Presupuesto. Ver ubicaciones de cajas de entrada de presupuesto a través de la ciudad. After receiving input from San Antonio residents and obtaining City Council service priorities, the City Manager and the City Staff develop a Proposed Balanced Budget. The City Manager meets with all City Departments to review Budget proposals during the month of July. In August, the City Manager will present the City’s proposed Operating and Capital Budget reflecting the Community and City Council priorities. Before adopting a final Budget, City Council may choose to change any aspect of the proposed budget, as long as the changes result in a balanced budget. The budget adoption must take place before September 27 of each fiscal year. The Adopted Budget is then presented and filed with the City Clerk, and copies are provided to City Departments, agencies and civic organizations. Additionally, copies of the Adopted Budget are available for residents to view at all San Antonio Public Libraries.